Russia experienced an extreme spike in death rates in the immediate aftermath of the break-up of the Soviet Union. 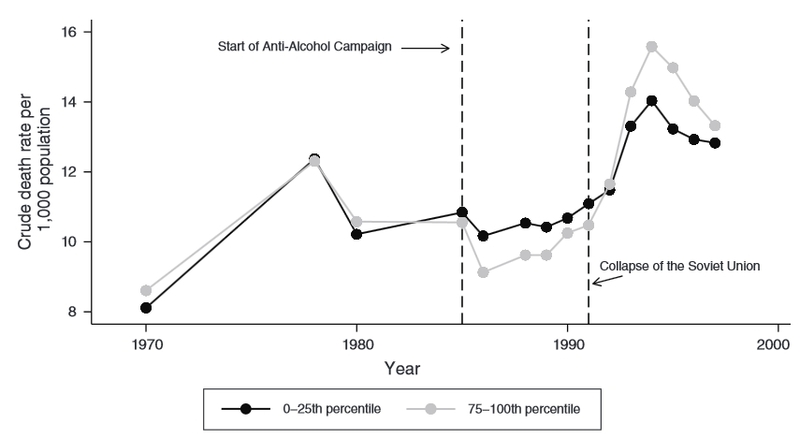 Jay Bhattacharya, Christina Gathmann and Grant Miller write that while this has typically been explained using political and economic arguments, the real cause of Russia’s mortality crisis may have been the end of Mikhail Gorbachev’s anti-alcohol campaign. 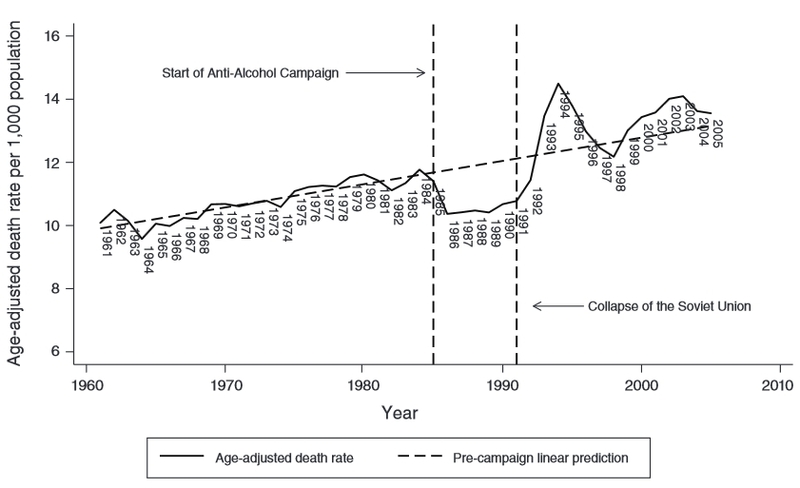 Using a series of statistical tests they illustrate that Russian death rates fell significantly during the campaign, with the hardest drinking regions experiencing a larger spike in death rates after the fall of the Soviet Union. Note: Data available from The Human Mortality Project. Pre-campaign linear trend estimated using ordinary least squares regression of mortality per 1,000 population on pre-campaign year. Finally, we document cross-country patterns of mortality throughout the 1980s and 1990s that are commensurate with campaign exposure in other former Soviet States and Eastern European countries. Figure 3 compares de-trended crude death rates in former Soviet and other Eastern European states with those from Russia between 1960 and 2005. Former Soviet states in the West and in the Baltics exhibit mortality declines similar to Russia during the late 1980s, and these are followed by similar surges during the early 1990s. This pattern is also present – but attenuated – in former Soviet states with large Muslim populations for whom alcohol policy matters less (in the Caucuses and Central Asia). By contrast, mortality patterns in Eastern European countries undergoing political and economic transitions, but not subjected to the campaign (the Czech Republic, Hungary, Poland, and the Slovak Republic) are starkly different. Jay Bhattacharya is an Associate Professor of Medicine and a CHP/PCOR core faculty member. His research focuses on the constraints that vulnerable populations face in making decisions that affect their health status, as well as the effects of government policies and programs designed to benefit vulnerable populations.